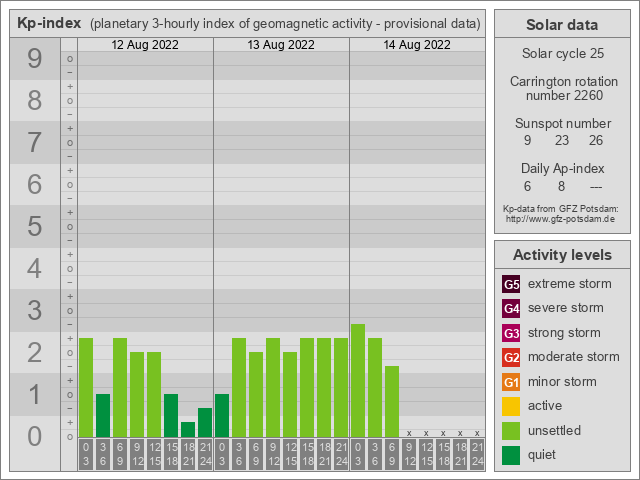 The K-index quantifies disturbances in the horizontal component of earth’s magnetic field with an integer in the range 0–9 with 1 being calm and 5 or more indicating a geomagnetic storm. It is derived from the maximum fluctuations of horizontal components observed on a magnetometer during a three-hour interval. Kp and its related indices are generally recognized as indices measuring worldwide geomagnetic activity. The Kp index is used for the study and prediction of ionospheric propagation of high frequency radio signals. Geomagnetic storms, indicated by a Kp = 5 or higher, have no direct effect on propagation. However they disturb the F-layer of the ionosphere, especially at middle and high geographical latitudes, causing a so-called ionospheric storm which degrades radio propagation. The degradation mainly consists of a reduction of the maximum usable frequency (MUF) by as much as 50%. Sometimes the E-layer may be affected as well. In contrast with sudden ionospheric disturbances (SID), which affect high frequency radio paths near the Equator, the effects of ionospheric storms are more intense in the polar regions.